The DUO has a multitude of pockets and compartments easily organize diapers, bottles, sippy cups, food and toys, while keeping your phone, PDA, wallet, keys and other personal items safe and dry. The DUO features the new Shuttle Clips; a unique strap and fastening system that allows the DUO to attach neatly and conveniently to the handlebars of any in-line stroller and then convert into a cool, hip shoulder bag. When attached to the stroller, you can leave the shoulder strap attached or remove it for a cleaner look. •There's room for all your essentials - and it includes new magnetic closures throughout and a comfy shoulder pad. •Very durable poly-canvas construction - will last for years! 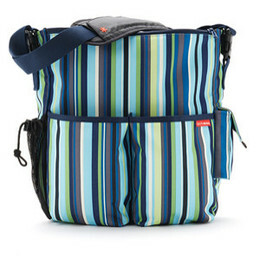 PLEASE NOTE: This bag is not huge - it is perfect for taking multiples on short excursions. If you are looking for a larger (but similar) bag, consider our "Duo Double" diaper bags made by the same manufacturer.